What will the sale of Schrader Cellars to Constellation Brands mean for Napa's most storied vineyard? Beckstoffer's parcel of To Kalon has been the foundation of Schrader's success. Constellation's purchase of Schrader Cellars last week reset the Cabernet hierarchy in Napa Valley. Schrader is among the valley's elite, best-known for its top cuvées from Andy Beckstoffer's parcel of Napa's revered To Kalon vineyard, priced at $200 a bottle for the 2014 vintage. Napa and the rest of the wine world are still digesting the news, and speculation on the sale price has become a popular topic of conversation. Neither side has revealed much on that front, but even if one were to pencil out the value of the inventory acquired versus Schrader's operational expenses, the real wild card is how much value Constellation placed on Schrader's label cachet. We won't know for sure until the sale price is revealed in Constellation's next public report in October. But the Schrader sale is also a pivotal moment in the story of To Kalon. Constellation, through its ownership of Robert Mondavi Corp., already owns the largest portion of the historic vineyard in Oakville, roughly 550 acres of the 640 total; grower Andy Beckstoffer owns 89 acres and sells the grapes to more than a dozen wineries making about three dozen total bottlings. 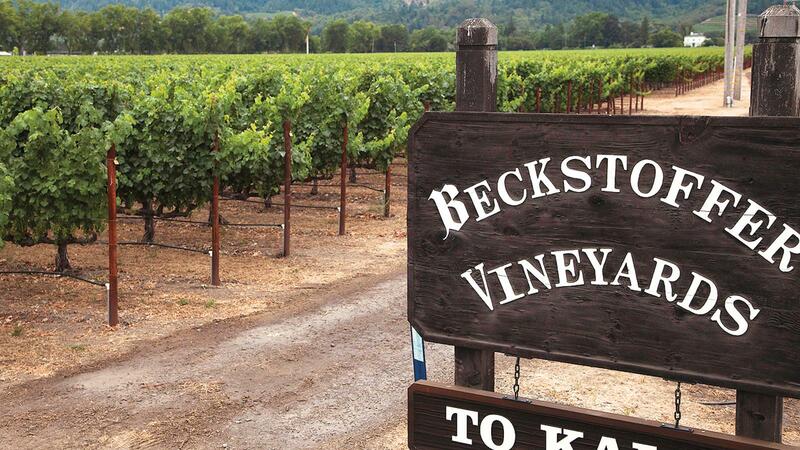 A source at Constellation said today that the company plans to continue working with Beckstoffer on Schrader's Cabernets from Beckstoffer To Kalon, Georges III and Las Piedras vineyards. But might Constellation add more Schrader To Kalon cuvées from its own holdings? The Mondavi To Kalon Cabernet grapes currently go to both Robert Mondavi Winery and to Opus One, part of which Constellation also owns. Opus One's annual case production is nearly 10 times the size of Schrader's typical run of about 3,000 cases, and it's also sticker-priced substantially higher than Schrader, at $285 for the 2013. The Mondavi To Kalon bottlings are priced at $155 and have a case run that ranges from 4,000 to 9,000 cases. Like Schrader, Mondavi To Kalon and Opus One each have two vintages in the cellar, 2016 and 2015, and soon a third with 2017, meaning whatever changes might occur with the distribution of the grapes won't likely be decided until 2018. Nonetheless, the jockeying among winemakers for grapes has begun. Schrader winemaker Thomas Brown is staying on, so he'll remain involved in the grape-selection process for Schrader going forward. The opportunity for Schrader, now also under the Constellation umbrella, to use Mondavi To Kalon Cabernet is another wild card—it would certainly allow the Schrader brand to increase production. Schrader is the highest-profile vintner using Beckstoffer grapes, including those from Oakville, Rutherford (Georges III) and St. Helena (Las Piedras), but others that have popularized the Beckstoffer To Kalon name include Paul Hobbs, Tor and Carter. How the sale of Schrader may impact Napa brand valuation won't be known for some time, but there is no doubt that Constellation's purchase has altered the landscape for Napa Valley Cabernet, especially when it comes to California's grand cru vineyard, To Kalon. The recent sale of both Ovid and Schrader has left me confused and somewhat leery of these wines in the future. They were the stalwart gems of my cellar. It's difficult for me to believe that the status quo with regards to vineyards and production will continue under new leadership and that the wine I have loved for so many years will remain untarnished. For the time being, I am hanging on to hope but may consider other pastures at the site of increased commercialism or dilution of the product. On the flip side, I suppose a shake up of my wine cellar could lead to new discoveries. Your recent article about 1968 and the impact of that vintage has compelled me to write. I too grew up in Anaheim graduating from KHS in 1975 and UCI in 1979. At my graduation, my girlfriend's father presented me with a bottle of wine (knowing that I had progressed beyond Mateus and Lancers). He owned a soil fumigation company that serviced many of the state's growers. The bottle was a 1968 Robert Mondavi Cabernet Unfined. Well, some well worn years later, I still have the bottle! Knowing that it has been stored in less than optimal settings, I keep it along with my early Duckhorn merlots and assorted Napa bottlings from back then that a student with limited funds but a growing palate could afford. I was fortunate enough to be treated to several tastings of that 1968 Mondavi as it graced several dinners at my then girlfriends house. Her father has since passed, and she and I remain friends. More than anything, that wonderful, unfined cabernet introduced me to the incredible new world of (Napa) wine. As my three children grow up and go off to college, I am hoping to provide them with a similar life altering experience. Thanks for sharing!